This software is suitable for courier business. Courier software and delivery dispatch software program for ordering, delivery tracking, courier, messenger, service vehicles or trucking industry. It's perfect for couriers to plan working hours so that the orders do not overlap with someone else and keep track of scheduled appointments. It'll store the information about clients, such as their address, telephone, email and comments. This modern and extremely handy program makes management a real pleasure. Included are two viewing modes, an automatic search option and password protection. The program has a handy interface to calculate and show the "fee charged", helping you to make decisions quickly. It's possible to create reminders to alert couriers about the things they should do. Available is an automatic search and auto-field filling for a customer, who has already been entered to the database. You can view the information about payments, daily income for any day at any moment when you need it. For those people, who work in Microsoft Outlook, it's possible to export data. Export of data is available to different formats: XLS, TXT, HTML, XML, PDF for its adaptation for other programs. You can save appointments into an iCalendar file with the .ics extension. It facilitates data transfer between applications that use scheduler and other applications, such as Apple iCal, Microsoft Exchange Server, Novell GroupWise. In case of crashes or virus attacks, there is an auto backup function with a possibility to remove old archives automatically. There is a low-priced edition of the product for a workgroup that allows users to work simultaneously over the network. You pay for the program only the first time and get all new versions of this program for FREE and for a lifetime! 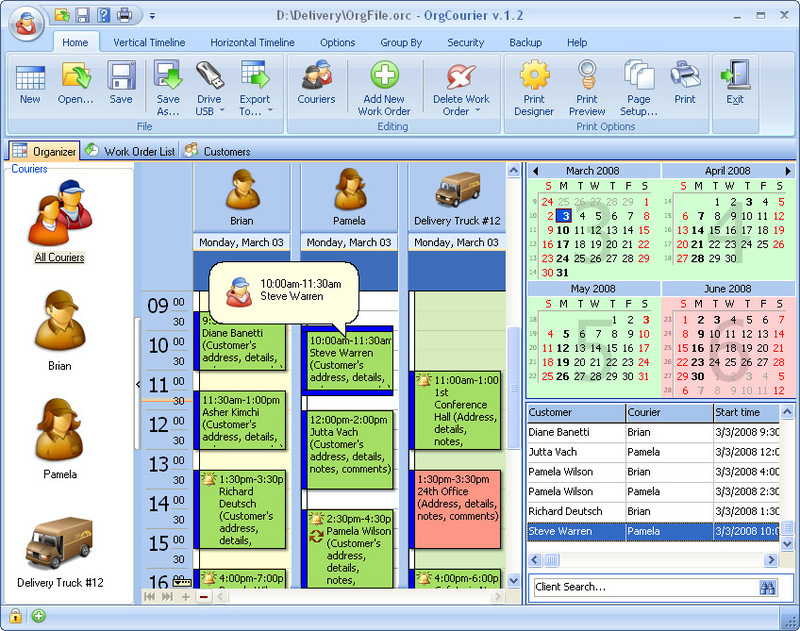 courier software,courier service software,courier management software,calendar,courier tracking software,scheduler,scheduling,organizer,planner,courier management system,courier business software,courier billing software,courier management OrgCourier is a must-have schedule management tool for anyone who has a courier business. It supports infinite number of profiles and has a well-organized navigation system. The program has data export, password protection and printing features.